Dear God, I need comfort tonight. Please let me sleep and feel loved and appreciated and safe. Amen. And, as is usually the case after praying, I fell promptly to sleep. But what happened next was definitely not typical. That night — last night — I dreamed one of those perfect dreams. Sweet, simple, uncomplicated, without a hint of sadness or anger or fear or loss. It was a dream of pure happiness. I dreamed of a dog I once owned, whom I”ll call “Ranger.” The plot of the dream doesn’t matter, but what mattered was how real Ranger was to me in that other realm of consciousness. I could feel his thick coat, short and somewhat coarse. I could smell his distinctive scent and hear his panting that sounded like an old man chuckling. In my dream, I learned that I was mistaken about his death; he was alive and when I found him again, he leapt about joyfully, as he had when he was younger, before arthritis and tumors robbed him of his deer-like gait. He ran this way and that, smiling his panting smile and wagging his inefficient fat stub of a tail, so unique to Australian Shepherds. I felt flush with happiness and blessed with good fortune — he was alive and healthy, after all this time! I had a second chance to spend time with my dear friend! I hugged him and we played and I recognized the funny way his left ear was bent and the beautiful, soft, white, scarf-shaped coloring he had around his neck that always gave him the look of a dandy, even when he wasn’t wearing his beloved bandanas. I put my arms around that neck as I’d done so many times before, and he wrapped his chin around my neck in an unmistakable hug. I remembered briefly how many times I had cried silently into that furry neck and how he’d patiently licked the tears from my face. In my dream, Ranger came to live with me again, following me around endlessly, always right under my feet, just as he’d always done, even when he was old and frail and stairs had become an enormous challenge. But unlike in our previous time together, I didn’t snap at him when I tripped over his long legs. I didn’t complain about the tufts of hair he was always leaving behind on my hardwood floors. I fed him the blueberries and bacon and carrots that he so dearly loved. I took him to the dog park and in the car and to Home Depot where the orange-aproned employees fed him dog treats. I made the most of every minute, every second, because I knew, like I hadn’t known before, how much I would miss him when he was gone. I am ashamed to admit that the last couple of years of Ranger’s life were not very good. Those years coincided with the last years of my marriage, and I was irritable, distracted, and depressed. 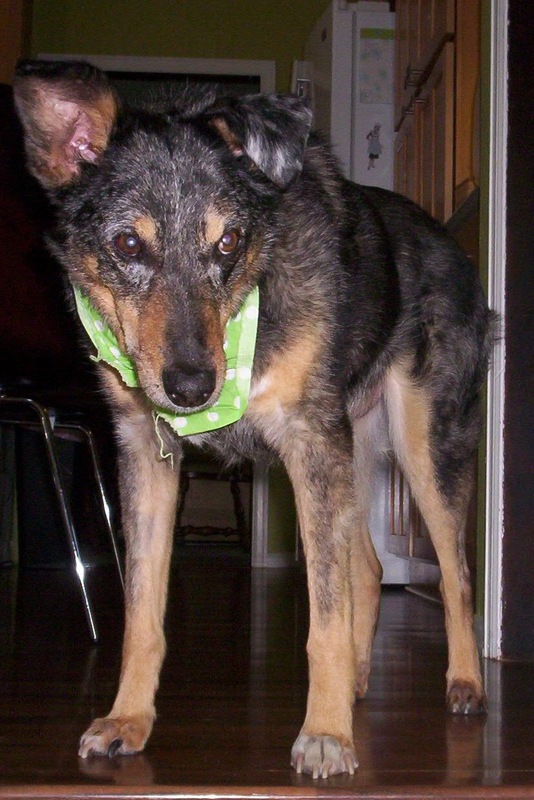 Ranger was so attuned to me, I feel certain that his rapid decline was tied to his anxiety about me. I hate remembering how few walks he got during those last years, how many times I barked at him to get out of my way, how infrequently I laid on the floor and cuddled him until he purred like a cat. I hate acknowledging the relief I felt when he was finally at peace, eternally asleep in his bed next to mine, courtesy of the vet’s dreaded needle. I will forever wonder if I ordered that needle when I did because of his pain or mine. No human ever had a more loyal, more attentive, more empathetic companion than I had in Ranger. The fact that he is the one who came to me last night, when I most needed comfort, should not surprise me. When I woke up this morning, I struggled to hang on to the dream, clinging to those gossamer threads of comfort Ranger offered, silently apologizing, as I have a million times before, for not deserving his devotion in his final years. All day today, I have walked around with the memory of the dream fresh and tangible in my consciousness, the peace and serenity it brought to me still soothing my soul. I have reflected on so many precious moments I shared with a dog who carried me through some of the darkest days of my life. I have thanked the heavens over and over and over that I was blessed to know such a loving and kind being. But tonight, as I write this, I am fighting sleep. I do not want to succumb to the night’s slumber because I know that in doing so, I will lose Ranger again, and it may be years before he next visits. I have spent the whole day feeling close to him and comforted by his presence, but all of that will be wiped clean by another night’s sleep. And I do not want that. I don’t want to let go this time. Ranger left me long before I stopped needing him. And when I finally surrender to the demands of sleep, he will leave me again. And I will grieve all over again. “Ranger,” all dressed up in a bandana. He loved wearing them and being fancy. He had bandanas for all occasions. 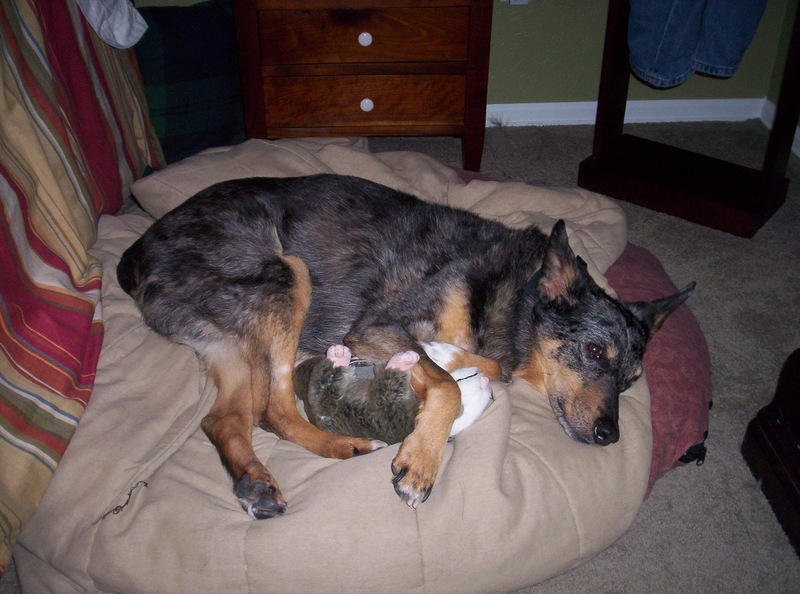 “Ranger,” with his favorite snuggle toy, Wally the Rat.